Dumbarton Castle is the oldest in the UK. At present, its history and heritage have no equals among other medieval mansions, houses and palaces as regards to age go. Dumbarton Castle rises above the southern Scottish town of the same name, on the bank of the River Clyde. The palace was built on foundations of volcanic basalt rock known as Dumbarton Rock and a high around 73 meters. On its other two sides, it borders the River Leven. 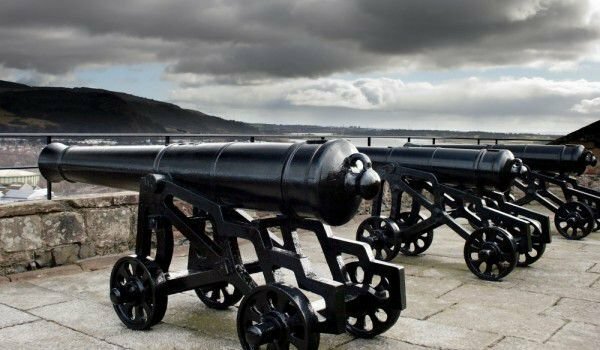 In general, Dumbarton castle functions as a military fortress for over 1500 years. Even during the Iron Age, the place has been the subject of much controversy. Perhaps there was a military outpost of the British, who traded with the Romans. One of the first written bits of evidence of archetypal Dumbarton dates from the 5th century in a letter of Saint Patrick. From 5 to 9 century castle was the center of the independent Kingdom of Strathclyde. During this period Dumbarton was often besieged by the Scandinavians. In medieval Scotland, Dumbarton, whose name comes from "Dun Breatainn" - "fortress of the Britons", was an important royal castle. Around 1222 it was already built of stone. Today, from the medieval structures of the palace have survived only two parts - one arch over the porch (The Portcullis Arch above the Guard House), built around 1300 and the portico itself, dating from around 1580. In summary we can say, that the most active years of Dumbarton castle were when it was used as a royal palace, as a sanctuary in times of trouble and a jail. In 1735 was built the governor’s house of King George, which dominates the side of the River Clyde. From the various buildings erected in, only the French prison was able to remain in the cleft of the hill. Before it can be seen some surviving walls. In 1865 all the military leaves Dumbarton castle, which has since been a popular tourist attraction. But the war years have not gone by for this medieval fortress. It is the focus of the wars of 1914, again in 1939 and ultimately recent fighting here was in from May 1941 when four German planes bomb the cliff during the attack on the Clyde. To enjoy Dumbarton the most, you must climb many stairs leading to the summit of the rock. From the top, the view is spectacular and thorough. A person easily becomes clear as to why this place can boast such rich historical events. Some 557 steps lead up to the White Tower Crag and the other remaining historic structures. Today Dumbarton is celebrated as a very important national monument and is protected by the Scottish cultural ministry. Rock climbing in Dumbarton is strictly forbidden and any injury or damage to the complex is treated as a crime.